Based on SUB-GHZ wireless sensor network technology, BW883 long distance wireless lock system provides an effective solution for refurbishing or buiding new hotel, which communication frequency is 470-525 MHz. All models can use ANSI Mortise, replacing easily a hotel's existing lock case and inside door hardware. Created with the elegant designer, the concept and technology is refined, contemporary and intuitive. Guests can open the door lock by the APP, RF cards, membership cards and other methods. With SUB-GHZ technology, BW883 wireless lock system achieves real-time communication and data exchange. BW883 also has some other features that are good for hotels. BW883 has five ways of unlocking: computer, card (room card or membership card), mobile phone(APP& Wechat). With ten functions, BW883 wireless lock will improve the hotel's work efficiency and service level. 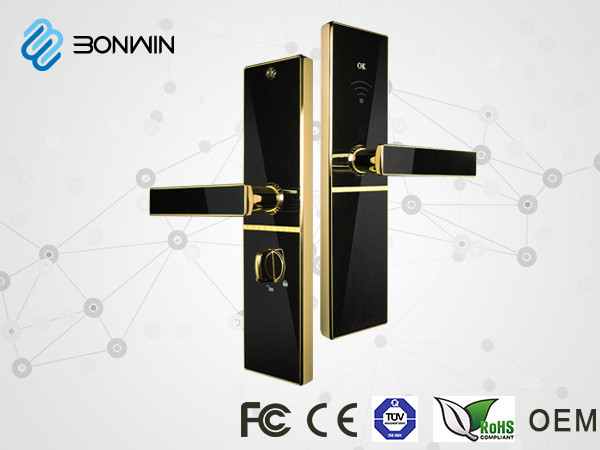 Bonwin wireless door lock adopts a unique design, which is simple and elegant. The following is the network topology diagram of the BW883 series. Generally, each floor can form a wireless communication network, including a switch hub, some controllers and a lot of wireless network door locks. The wireless network is created by the switch hub, the controller and the wireless door locks are automatically routed by the nearest principle. And the hotel client-sever can make different cards through the encoder, guests can open the door lock or make a service request by the cloud platform. With the time limit and gradation authorization of the door key, different authorizations of cards and other functions, the system achieves real-time communication and data exchang to manage hotel staffs and guests. For guests, they can be operated easily BW883 long distance wireless lock. BW883 wireless door lock is composed of a front panel, back panel and mortis. The mortise is main mechanism, consisting of housing, latches, motor, etc. Computer control panel is mounted inside front panel to read cards, to input/output control signal, light and sound signal and analyze these signals. Battery case is mounted inside back panel, powered by four 1.5V batteries. Besides, the lock is equipped with mechanical keys, which can be used when the lock is installed without being powered by batteries or electronic control part goes wrong. First, you can install the door lock according to the steps on the right. Secondly, you need to install the management software and do some related initialization settings. If you want to know more, please contact us!